In this book the authors introduce and explain many methods and models for the development of Information Systems (IS). It was written in large part to aid designers in designing successful devices/systems to match user needs in the field. Chief among these are website development, usability evaluation, quality evaluation and success assessment. The book provides great detail in order to assist readers' comprehension and understanding of both novel and refined methodologies by presenting, describing, explaining and illustrating their basics and working mechanics. 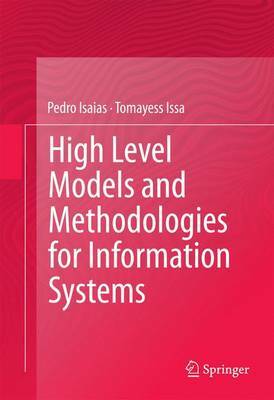 Furthermore, this book presents many traditional methods and methodologies in an effort to make up a comprehensive volume on High Level Models and Methodologies for Information Systems. The target audience for this book is anyone interested in conducting research in IS planning and development. The book represents a main source of theory and practice of IS methods and methodologies applied to these realities. The book will appeal to a range of professions that are involved in planning and building the information systems, for example information technologists, information systems developers, as well as Web designers and developers-both researchers and practitioners; as a consequence, this book represents a genuinely multi-disciplinary approach to the field of IS methods and methodologies.